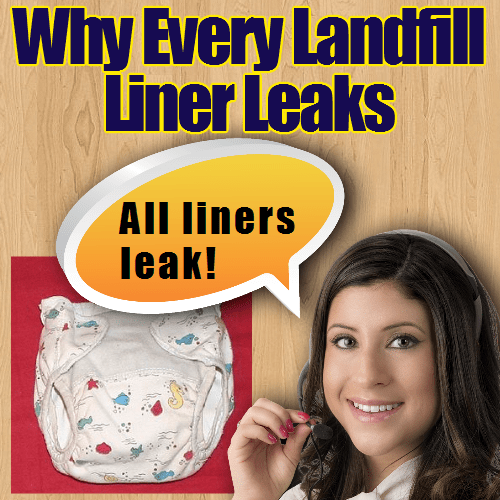 Landfill liner leaks are endemic. A small amount escapes from composite landfill lining systems which include both 1 metre thick a clay layer, and a clay liner loses water/ leachate according to its permeability and the head of pressure of leachate over it. That is despite applying stringent design and operational requirements for landfills, landfills continue to leak, causing varying degrees of environmental impact. In fact no single landfill ever built will not allow the passage of some water through the base, even within the initial design life of the lining. In engineering terms the rate of movement through the liner will be exceedingly small per unit area, and can be calculated by using the D’Arcy Equation. Nevertheless, when the large area of the base is considered, even extremely low permeabilities result in “leakage” rates in the tens of cubic metres per annum for average sized sites, where the lining is perfectly installed, and undamaged. Although this initially sounds alarming, all landfill designs are based upon groundwater impact assessments (IAs), and it can safely be assumed that the design “leakage “ rate will be far lower that the dilution in the groundwater provided by natural groundwater movement. The use of composite liner systems is still a relatively new practice, and studies have indicated that many of the early lined landfills lined only with a synthetic flexible membrane, or geomembranes (the commonest being HDPE) are leaking.Contact Us for Closed & Active Landfill Remediation Service. However, it should not be forgotten how rapidly the waste industry has progressed from unlined “so called” dilute-and-disperse landfills to the single geomembrane, and now in most nations composite lining systems are mandatory. Landfills were not previously lined at all, and have a long history of leakage with resulting environmental impacts to groundwater. Before lining was introduced in the 1980 impacts on surface water, the unsaturated zone, and the atmosphere per tonne disposed were far worse. In the United States & Europe, prior to the 1980’s, landfills did not have specific construction requirements aimed at preventing leakage. 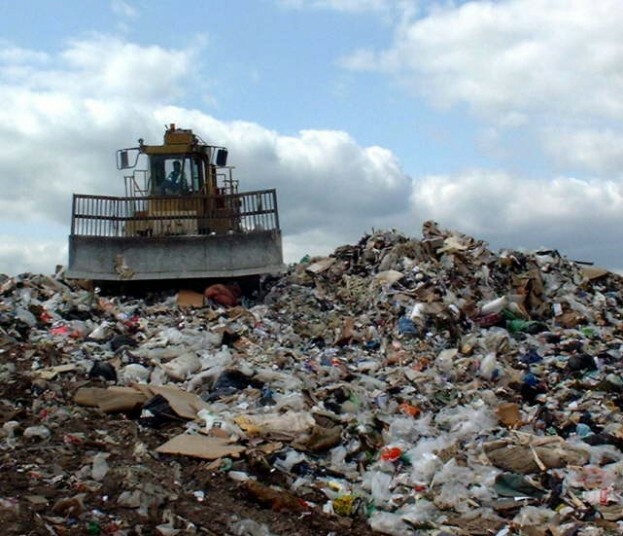 In the early 1990’s, to reduce existing environmental impacts and to prevent future impacts, the United States Environmental Protection Agency (US EPA) called for the closure of older, unlined landfills and began adopting minimum standards for new landfill design. A similar process was underway in the UK and Europe from the early to mid-1980s. In the UK the relevant guidance was contained in the Waste Management Papers (now withdrawn), published by the DoE (HMSO). Waste Management Paper 26b being the most important. A primary design requirement of the new 1980s-1990s standards was the recognition that a composite landfill liner system would be essential for all future landfills. Composite landfill liners, while both being introduced for the same reason on both sides of the Atlantic, vary in their engineering detail between Europe and the US. and a lower layer of soil at least 0.6 metres-thick with a hydraulic conductivity of no greater than 1 x 10-7 cm/sec (1 x 10-9 m/sec) (or an alternative combination that provides equivalent hydraulic conductivity). The standards also require landfills to have a leachate collection system designed to maintain the depth of the leachate over the liner less than 30 cm. Most US lining systems incorporate a double synthetic lining with leak detection placed between the upper and lower layers. This practise has seldom if ever been adopted in Europe, where rather than investment in the detection layer, it was decided that the equivalent cost would be better invested in an increased depth of the soil (clay) layer. In the EU the lower liner of soil material (clay) must (generally) be a minimum 1 metre thick. Several years of environmental monitoring at newer landfills designed and constructed in accordance with US EPA regulations, and to similar requirements elsewhere, has indicated that where landfills to the new standards have leaked, it has generally been as a result of construction errors and/or failed operational procedures. Construction errors as reduced by the implementation of stringent Construction Quality Assurance (CQA) procedures, but experience has shown that these can only reduce imperfections in synthetic (HDPE) membranes as installed to a low level. Some leaks will still be present. 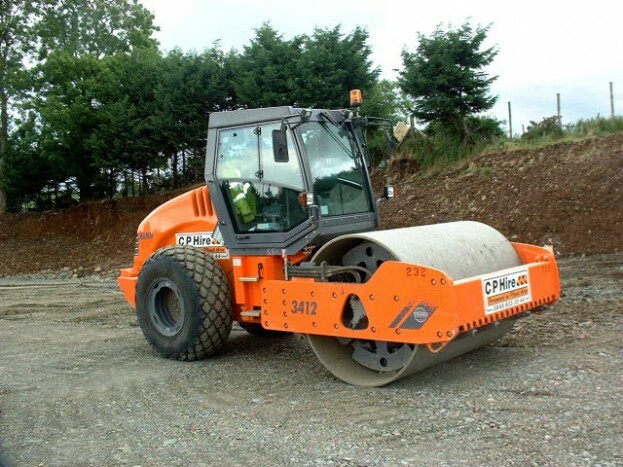 To find, and then repair HDPE landfill liner leaks (punctures) specialist Geophysical Leak Detection Contracting Companies have evolved which offer to carry out a survey after the leachate drainage layer has been installed, and before the first waste is placed in each landfill cell. This surveys can pinpoint leaks found with great accuracy enabling each to be patched before the first waste is placed. Operational procedures are being tightened progressively, and are particularly tightly controlled in the UK nowadays, by the environmental regulators (EA, SEPA, and EHS (NI). It is recognised that the emplacement of the first 1 metre of waste above the landfill lining must be carefully undertaken in such a manner which avoids physical damage either by vehicles tracking too close to the liner and imposing excessive localised direct loads, or by the waste containing large items which may induce excessive point loads or punching forces. information on withdrawn Waste Management Papers.